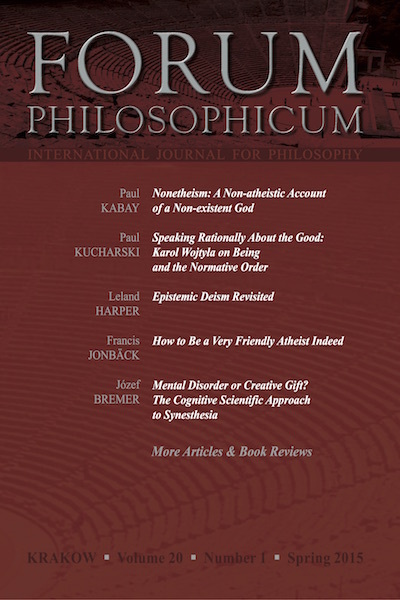 The Spring 2015 issue of Forum Philosophicum makes available four analytical papers discussing a range of problems connected with the philosophy of religion and philosophy practiced in a religious context. Paul Kabay’s “Nonetheism: A Nonetheistic Account of a Non-existent God” introduces a philosophical stance that views God as non-existent, yet impossible to reject. The property of existence is, in this approach, one that cannot be ascribed to the object of cognition we call God. Paul Kucharski, in his paper “Speaking Rationally about the Good: Karol Wojtyła on Being and the Normative Order,” shows, through an analysis of Karol Wojtyła’s ethical stance, how any serious ethical approach requires thatweacceptthe existence of anobjective and normative measure of goodness. In the paper “Epistemic Deism Revisited,” Leland Harper offers somecriticism of Bradley Monton’s, Nancey Murphy’s, and Thomas Tracy’s views concerning God’s epistemically inaccessible activity on asubatomic, non-deterministic level. Francis Jonbäck presents a modification of the stance called “Friendly Atheism,” to which he gives the name “Very Friendly Atheism Indeed.” These papers are accompanied by a survey of recent research into the phenomenon of synesthesia by Józef Bremer(“Mental Disorder or Creative Gift? The Cognitive Scientific Approach to Synesthesia”), who points to several philosophical questions raised, and potentially answered, by such research. The issue also brings totheattentionofreaderstwo book reviews.